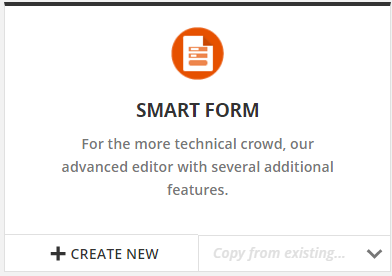 Note: This Knowledge Base article describes using the older, standard Smart Form selected using the "Smart Form" icon shown here. We recommend you select an ONTRAform Order Form instead, available on the stand alone ONTRAforms and as Order Form blocks in ONTRApages. 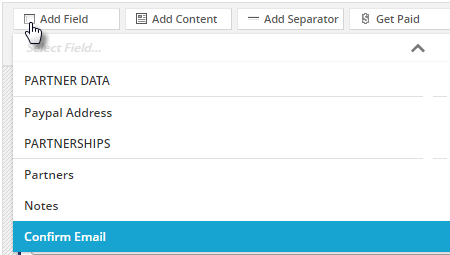 ONTRAforms are mobile responsive, can be configured as stand alone, click to pop and automatic lightbox forms, and come with dozens of ready to use templates. ONTRAPORT Order Forms allow your customer to purchase your products or services. 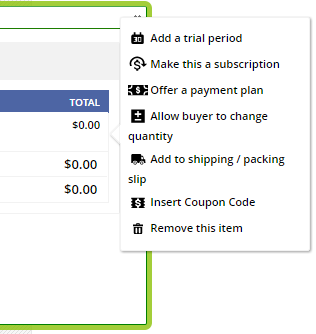 Each Order Form allows you to select exactly which Product(s) will be purchased when the form is filled out as well what Rules will fire on either a successful or failed transaction. In ONTRAPORT, an Order Form is just a Smart Form with a special function enabled. By that we mean, clicking the ‘Sell Products’ button on an ordinary ONTRAPORT Smart Form enables the sales functionality, adds all form fields required for a sale, and transforms your regular Smart Form into an Order Form. In essence, anything you can customize on a Smart Form in terms of design and function, you can also do with an Order Form. Click + Add a shipping method This is where you can set rates for international or domestic shipping of your products and more. Enter a name and price of your shipping type. 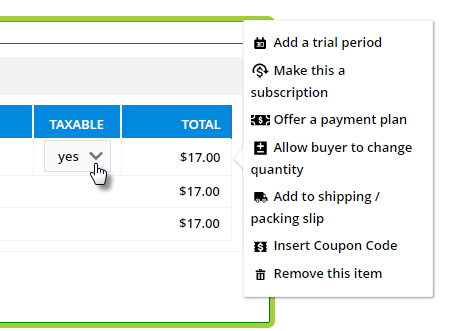 TIP: Shipping charges are not considered revenue and will not show in the "Next Charge" column in the Subscriptions and Payment Plans section on the Purchases tab of the Contact record. 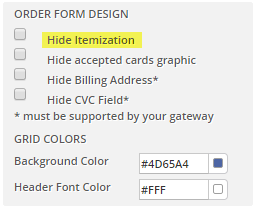 Hide itemization. This hides the itemized list of products on the form. At the bottom of the settings page is the Advanced section. Select from the following types of code/methods we supply to place a form on your website. 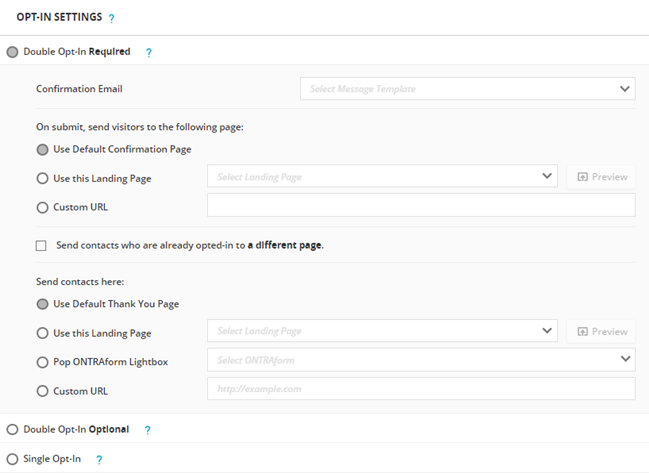 This option makes ONTRAPORT host the form on its own page for testing purposes. Remember to change the "http:" to "https:" to serve the page from our secure servers; the default uses the non-secure "http:" protocol because this function is shared with regular opt-in forms. 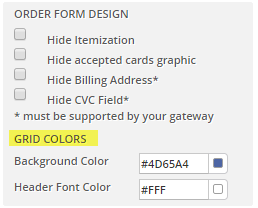 In addition to hosting your Order Form on a Secure Landing Page on a domain we provide, you can also use the Order Form's HTML code and embed it on your website's secure page. Edit the HTML code and replace all instances of http:// with https://. This will serve all of the form elements from our secure servers, including custom images you have uploaded, and prevent browsers from blocking the "insecure" content. This process works with all Smart Forms, including Order Forms. How Can I Change the Currency Symbol? ONTRAPORT's easy gateway integration allows you to sell products in your choice of currency by choosing a gateway supporting that currency. Configure the currency setting in your gateway, select the same currency in ONTRAPORT, and get started processing orders in that currency immediately. Gateways that process in currencies other than USD include Authorize.net, eWAY, PayPal Pro, Stripe and WorldPay. For complete instructions, including important warnings about currency transaction fees and other costs, see Integrating a Payment Gateway - Currency Options. Q. Why can't I use regular PayPal for subscriptions, free trials or payment plans? A. Our implementation of regular PayPal does not support fool-proof communication from the closed PayPal system back to ONTRAPORT. Because of that, we cannot ensure that subscriptions or subsequent payments have actually been completed leading to the possibility that your product will continue to be provided to customers who have not paid. Q. My order form is displaying a security error in the browser. What's up? A. The order form code will inherit the property of the page it is hosted on, so make sure that page is on a secure domain. In some cases, images you link in or upload into ONTRAPORT for use on your order form will be listed in the form code with a non-secure "http://" protocol. Use the HTML Version of the form code and edit any references to "http://" to read "https://" (note the "s") and post the edited HTML Version of the code on your page. Q. I want my contacts to verify their email address on the order forms. Can I do that? A. Yes, add the field Confirm email from the field selection list to the form. Will you be giving us the ability to offer promo/discount codes to customers? This is critical to my clients' campaigns. This is going to be one of the first features that we release for ONTRAPORT. However, we don't have an exact date for the release. I will say I've seen the interface in progress and it's going to be sweet! I also reached out with the same answer in ticket #3585 if you want to communicate there with any further questions you may have. 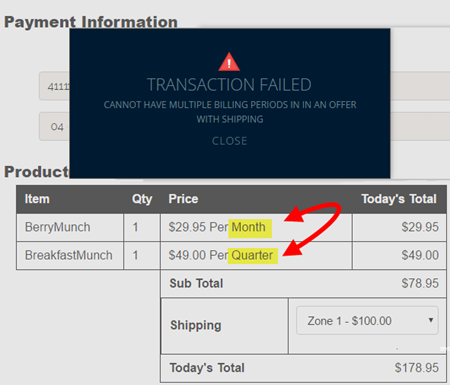 Is it possible for the order form to popover the current page rather than redirecting to another page to fill out the payment details? In other words. I click on the Buy Now button and instead of going to another pay a popover light box comes up where I can enter my details and press submit. I second Jason's request to have discount/promo codes without having to build out separate forms. Please advise if this is possible. Is there a way to make an Order Form list several products and allow the customer to choose which from the list he/she wants to actually purchase? Otherwise, you have to create many forms for each product and then a separate link to each of them (a lot more work and tedious). 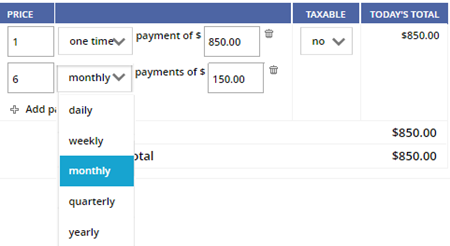 Having the ability to add several products to a form with a checkbox for the customer to fill out for which products to add to cart, would be super helpful and time-saving. Is this already available somehow and I'm missing it? Hi, as of today, the option "
This option makes ONTRAPORT host the form on its own page. The link to the hosted page is given to you upon selecting this option." is insecure. Adding HTTPS instead of HTTP at the beginning of the provided URL used to work, but no longer does. Is it just me, or shouldn't order forms always be secure, at least if they're hosted by Ontraport? We edited the content to reflect the modern browser's objection to "mixed content" being served on a secure page, and indicated the "Host my form for me" should have the protocol changed to "https:" if using it for your order form. When an order form is completed, there is an invoice emailed to the client. Is there a way to change the "Invoice" title to "Order Confirmation?" You can add several products to the order form and set the quantity at zero; the customer can then select the quantity they want of each item (from zero to any number of the products). Look in THIS SECTION under item 3. d. where you can allow the customer to select the quantity. 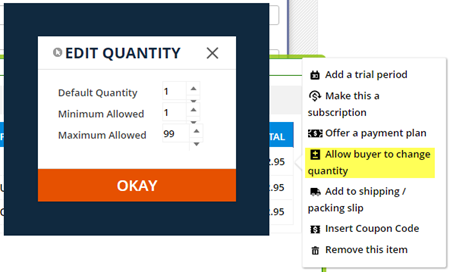 You have the option to start the quantity at either zero or one. How can i give free products, I have created the order form, but it asks me use payment gateway. How can i remove payment gateway from the order form and create a simple signup form? When will you fix the paypal integration problem so we can offer payment through paypal? The PayPal integration works, but only for one-off sales only. It will not work for payment plans, free trials or subscription products. Contact Support if you are having trouble with the PayPal integration for sales of products without payment plans, free trials or subscription products! Can I do a one time offer (OTO) upgrade to add to an existing order?